The AEM Center is a resource for education stakeholders that provides support for the procurement and use of accessible educational materials. In addition, the AEM Center provides support for the use of AEM in early learning, higher education, and workplace settings and has extended its reach to include educational materials that are first developed and distributed in digital formats. 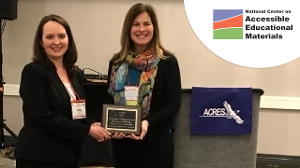 The AEM Center at CAST is the recipient of the 2019 Exemplary Program Award in Educational Technology from ACRES. Cynthia Curry is Director of the National Center on Accessible Educational Materials for Learning (AEM Center). She is responsible for ensuring that the Center meets its goal to increase the use of accessible educational materials and accessible technologies by learners with disabilities across preK-12, higher education, and workforce development. So, You’re an AEM State Contact and/or NIMAC State Coordinator. What Does That Mean? If you’re an AEM State Contact and/or a NIMAC State Coordinator, you play a critical role in ensuring that accessible educational materials are provided in a timely manner to the students in your state who need them. Whether you’re new or have a history in this position, please join the NIMAC and the AEM Center as we discuss the importance of these roles, responsibilities, and the technical assistance and resources available to you. We’ll reserve plenty of time for your questions. This is the first of two joint webinars to support the work of AEM State Contacts and NIMAC State Coordinators. Early in 2018, the NIMAC and the AEM Center will co-present on the provision of NIMAS files and related topics. This presentation is part of a webinar series co-hosted by the AEM Center and the NIMAC. You’ll be walked through the ins and outs of Bookshare, with particular attention to what you need to know as an AEM State Contact and/or NIMAC State Coordinator. Bookshare is an ebook library for people who read differently and a key source of AEM, and it’s free for all qualified U.S. students and schools thanks to funding from OSEP. Learn how Bookshare can save your districts time and money and how you can partner effectively and efficiently with Benetech, the parent company of Bookshare. Come with your questions for Bookshare and your colleagues. Accessible Educational Materials in the IEP: What are they? Where do they fit? CUE Conference 2015: Diverse Learners Symposium Spotlight Presentation. Educators and families often struggle with AEM questions. Explore seven points in the IEP process where AEM can be considered and documented. Hear about consideration questions and examples for each point that support use of AEM by students who need them for participation and progress on IEP goals and in general education curriculum. AEM Center Technical Assistance Specialist, Steve Nordmark, discusses accessibility of edtech products with Education Talk Radio host, Larry Jacobs. AEM Center staff, Cynthia Curry and Luis Perez, discuss the purchase and use of accessible educational materials and technologies with Education Talk Radio host, Larry Jacobs.